I think I just found one of my new favorite websites. Information is Beautiful is a project of David McCandless who calls himself “an independent data journalist and information designer” who has a passion for “visualizing information – facts, data, ideas, subjects, issues, statistics, questions – all with the minimum of words”. Basically, Information is Beautiful shows visual representations of information that can be difficult to process in a written format. 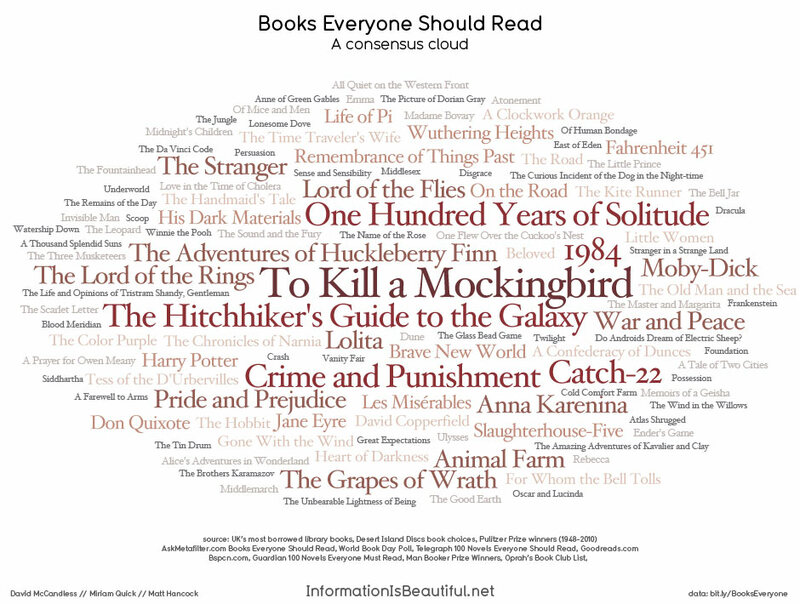 I found it via The Mary Sue, which had a post David’s visualization of Books Everyone Should Read (“a consensus-cloud of most mentioned titles from various book polls & top 100 lists”). I’ve included it as the image for this post, but you’ll really need to visit his post to understand the analysis and the underlying data (which you can see on a Google doc). Aside from visual representations, David also posts… guess what… Interactive Maps! Check out this one about America’s health stats.